Un wargame en solitaire sur les campagnes de Napoleon couvrant toute sa carrière de général, depuis la première campagne d'Italie à Waterloo, pas moins de 11 campagnes reliées entre elles ! Field Commander Napoleon is our biggest game to date, as befits the Empire, the Emperor, and his Grande Armée! The game is so massive it requires a 4" high box! Wan Chiu created the artwork for this mega game. He got off to a fantastic start with a classic box cover design. The game design focuses on the battlefield tactics and Napoleon’s powerful personality. Through political and military cunning, Napoleon swept France to super-power status. In previous Field Commander games, supply was a primary concern. As the Emperor himself said, “An army travels on its stomach.” In this game, Napoleon’s achievements and public adulation drive all facets of game play. Be successful, gain the support of your troops and your countrymen, and you can achieve anything! 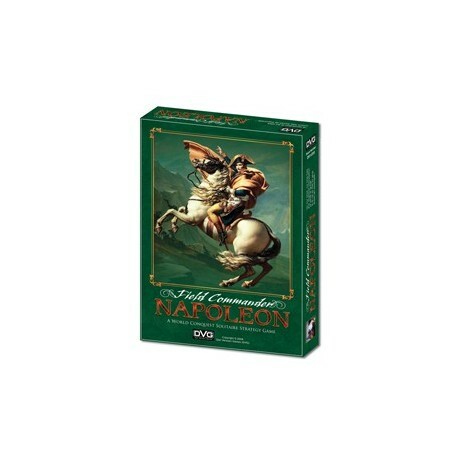 The game spans all of Napoleon’s campaigns from Italy in 1796 to Waterloo in 1815. The force counters are a rectangular 0.625” by 1.25”. This allows the use of Line and Column Formation tactics in battle! Each Force has a troop quality: Elite, Veteran, Line, Poor Line, or Conscript. Get a deluxe mounted Battle Map Board fit for an Emperor! If you pre-order Napoleon through the DVG web site, you will also receive a deluxe mounted version of the Battle Map board (in addition to the standard Battle Map). The mounted Battle Map Boards will not be available later. The flexible game system, optional historic rules for each campaign, and the Lifetime Immortality system maximize replayability. This game is perfect for fans of Napoleon and solitaire games in general. The complexity level is ideal for both beginners and experienced gamers.